Hi friend, I’m so excited to tell you about something I’ve been working on. A NEW cookbook! Isn’t the cover beautiful? 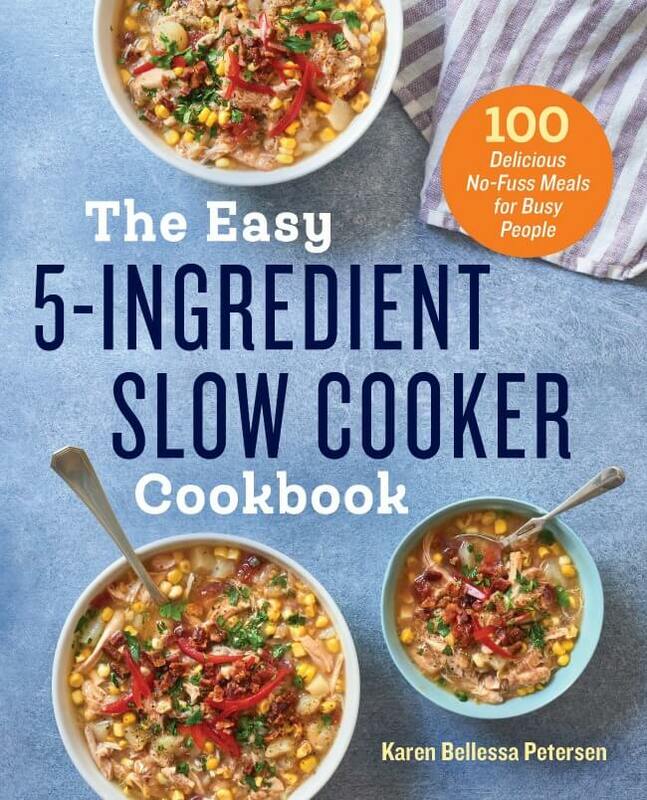 The Easy 5-Ingredient Slow Cooker Cookbook will be available September 26th, 2017. So in just a little over a month. And good news…you can pre-order right now! 100 recipes–there are 100 recipes including breakfast, soup, chili and stew, meatless meals, chicken, turkey, beef, pork and lamb, and desserts. 5 Ingredients–Each recipe contains only 5 primary ingredients plus some pantry staples (i.e. milk, butter) and simple spices (i.e. garlic powder, chili powder). 15 Minutes of Prep or Less–The recipes found in this book will require no more than 15 minutes of prep time and no mandatory precooking requirements. If you want, you’ll be able to throw everything into the slow cooker in the morning, leave, and come home later to a nutritious, delicious cooked meal. Many Recipes that Cook for 8+ Hours–I know that many of you are hardworking professionals who simply want dinner “done” by the time you get home from work. So at least half of the recipes I developed for the book require 8 hours of cooking time. Low or No Processed Ingredients–The recipes in this book don’t contain ingredients like canned soup, dry soup mix, packaged seasoning mixes, or other highly processed, artificially flavored ingredients. I love recipes that use ingredients such as dried beans cooked from scratch and fresh vegetables. Some recipes in the book use real-food convenience products such as canned beans, canned tomatoes, tomato sauce, tomato paste, canned broth, frozen vegetables, salsa, dried spices, and other similar items. If you want to eat more healthfully, when a recipe calls for any of these ingredients, you can always choose an organic and/or low-sodium version of the item. Sound good? Pre-order your copy today! The price point is really affordable and I think you’ll really enjoy this book for a long time to come. And guess what??? If you pre-order the book you will get instant access to BONUS materials. Here’s how to get the bonus content right now. I just pre-ordered. So excited to try out some new recipes. BTW I love that this book has very little processed foods especially canned soups. Trust me, I use them and I know there is a time and place for them for speed and convenience and even cost but sometimes, I just want to do without them. I applaud that you avoided them and didnt take the easy way out and include them. Thank you so much, Claudia! I so appreciate your kind words. Just pre-ordered your new book. Looking forward to getting it in my hands and trying out more of your recipes.